A southern Indiana parish hopes to find a nonprofit group to occupy and maintain its nineteenth-century rectory in exchange for nominal rent. As churches throughout Indiana close and consolidate, congregations and communities struggle to find new uses for vacant religious structures. 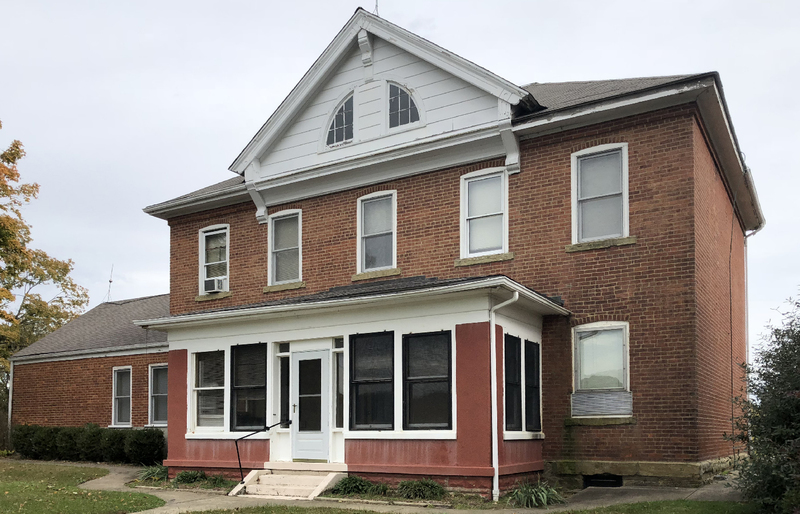 Indiana Landmarks is working with the Roman Catholic parish of St. John Paul II in Clark County to find a tenant for its 1859 brick rectory, one of three historic buildings on the St. Joe Hill campus in Silver Creek Township. German Catholics who settled at the foot of southern Indiana’s hilly Knobs organized St. Joseph Hill Catholic parish in the late 1840s. By 1859, they had erected a small frame church and a two-story brick rectory on the site. Tradition holds that congregation members quarried stone and hauled lumber for construction of a new Gothic brick church on the property in 1881, followed by a Queen Anne-style school a year later. 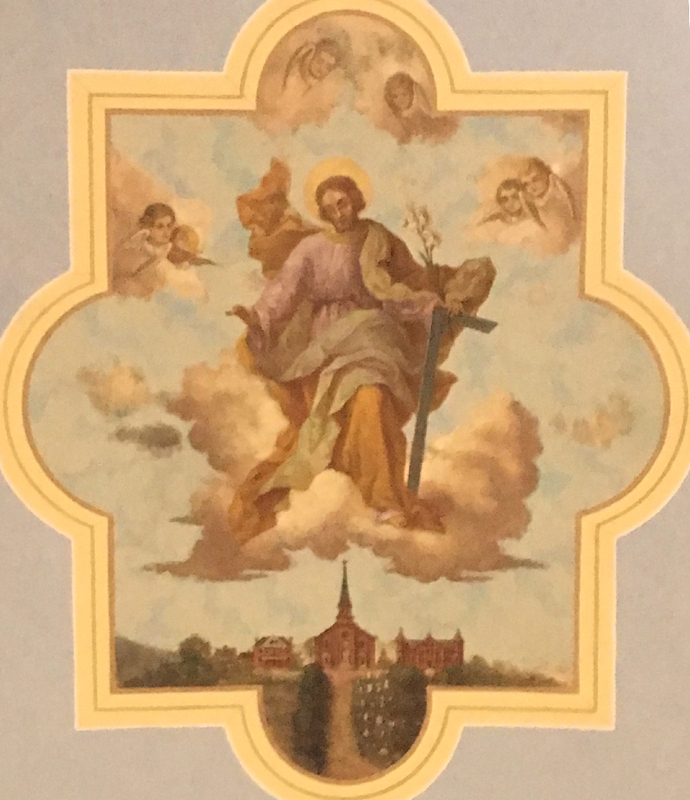 All three buildings are memorialized in a ceiling fresco in the nave of the church. In 2014, St. Joe Hill merged with St. Paul in nearby Sellersburg to formed St. John Paul II parish, which plans to build a new church near the site of the present St. Joe Hill campus. While the parish remains committed to preserving the original church and school, the future of the rectory remains undecided. Concerned about the possibility of demolition, parishioners reached out to Indiana Landmarks in hopes of finding a nonprofit tenant for the building, one whose ministry aligns with Catholic teaching. “At nearly 2,500 square feet, the building is well suited for office use,” says Greg Sekula, director of Indiana Landmarks’ Southern Regional Office. “The parish hopes to find a nonprofit group that will commit to long term maintenance and repairs in exchange for a nominal lease on the building,” he adds. Indiana Landmarks hired architect Ron Stiller of RCS + Associates and Mary Ann Tonini with Home Inspection of Kentuckiana to assess the rectory’s condition. They pronounced the building generally sound but in need of some structural repairs on the first floor, along with roof and gutter work and HVAC upgrades. The building has been weatherized for the winter while we help the parish look for a suitable tenant. To find out more, contact Indiana Landmarks’ southern regional office at 812-284-4534 or south@indianalandmarks.org.